If you love London but dread the busy streets in the big shopping season then let me share a haven of peace and quiet wonderment — the Royal Academy of Arts, located slap bang on Piccadilly right across the road from Fortnum and Mason. Walking into the spacious, classical courtyard takes me back to a London of times past, but only for a moment, for what is the artificial forest doing here, and these giant posters? The latter announce the current exhibitions featuring artistic phenomenon Ai Weiwei and Jean-Etienne Liotard, two great talents who could not be more different. But that is the Royal Academy, which is a fine knack of often having something for everyone. 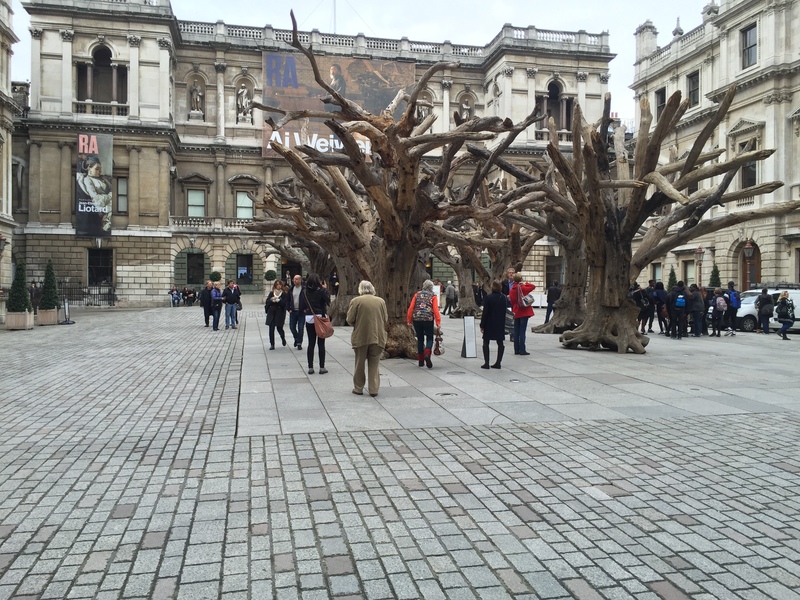 Ai Weiwei, he of the sunflower seeds at the Tate Modern five years ago, is back with a major exhibition of large-scale installations in steel, marble and glass, not to mention 1000 plastic crabs. For something completely different, climb the stairs and check out the serene paintings of Jean-Etienne Liotard, a Swiss artist in great demand in Enlightenment Europe. He travelled widely and drew great inspiration from the Orient. Known as “the Turk”, he dressed the part while working as a court painter. Coming up next year is an exhibition on painting the modern garden, using the work of Monet as a starting point, and moving on to Matisse. « Why bother with an agent?